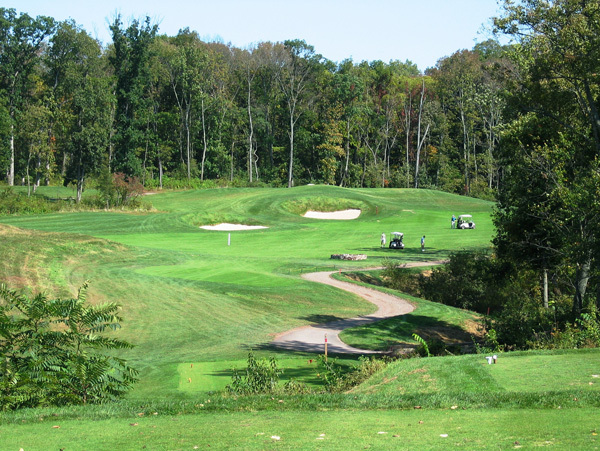 POTTSTOWN, Pa. -- It’s really no surprise that Raven’s Claw Golf Club keeps topping state public course rankings. Golfweek and Golf Magazine, to name a couple of minor publications, have taken note of the exhilarating combination of challenge and fun that Raven’s Claw offers. Only seven years young, Raven’s Claw is maturing quickly. Though first-timer expectations might be low due to the housing development you drive through to get to the course, once you’re on the course, the houses fade into the background. That’s because the course demands your full attention. Bausch Collection photo gallery. Not only does the course change gears frequently during the round and challenge every part of your game, but each hole is distinct unto itself. After the round, you’ll remember favorite shots, but you’ll be hard-pressed to remember where exactly you were in the round. The mastermind behind the design, local course designer Ed Shearon, based in Plymouth Meeting, respects the great, historic courses around Philadelphia. His goal is to bring classic golf course architecture—and the golf experience of the best private clubs—to daily fee players. Shearon also thinks long and hard about the "flow" of the round as the average player will experience it. He believes that a golf course should ease the player into the round, mix it up in the middle with a variety of challenges and leave the player with some memories as they wrap up the round. "I want a course that looks intimidating but plays softer than it looks," Shearon explains. And, at Raven’s Claw, thinking yourself around the course correctly can be more valuable than brute strength or distance. "If you can position the ball like you do in pool, you can beat the power player." Play the course a few times, and you’ll be wise to heed the axiom: "Once bitten, twice shy." For example, in the heart of the course, knowing the lay of the land and your strategic options can save you some risk/reward mistakes. Holes 10, 11 and 12 are challenging no matter how you slice them, but a modicum of caution will help you avoid big numbers. But that doesn’t mean you’ll be settling for bogey. On the second shot for the par-five 10th, a split-level fairway tempts an aggressive shot to the upper level on the right side. However, the lower level is easier to hit, has less risk of finding a bunker and even has a better angle into the green, which slopes right to left. From the tee on the right-turning, par-four 11th, the fairway looks like a thin ribbon of fairway, but there’s no need to risk aiming at the 150-yard marker. And on the par-four 12th, there’s no reason to challenge the bunker in the middle of the fairway, because you’ll still have a short-iron approach from behind the bunker. Ed Shearon is also concerned with the long-term sustainability of all his projects. The full name of his full-service landscaping company is Shearon Environmental Design Company. When he plans a golf course, he figures out ahead of time how he is going to use all the earth and boulders he excavates in other parts of the course. Nary a rock or peck of dirt is wasted. And, like his other two courses in the region, RiverWinds and the Renault Winery course, all the rain falling on the course is collected for reuse in irrigation. Raven’s Claw also kept a number of the natural rock outcroppings as visual accents on the course. The tee shot on the par-four 15th, for instance, is best played directly over the light gray shades of a wall of natural boulders. "I try to design a course to take a advantage of the existing features of the land," Shearon says. "Nature is the best designer." The 15th hole is also an example of how Shearon plays with your depth perception during the round. The carry over the boulders seems longer than it is, and there’s more short grass on the right side of the fairway, which is out of view from the tee. And as you become familiar with these features of the course over repeated play, you’ll also notice that there are a number of spots where the design offers players "bailouts" or high banks that bring wayward shots back into play. The right rough of the 15th can also helps you out there. Tricks of depth perception are also part of the experience of playing the dogleg par-four 9th hole, which many consider the course’s signature hole. From the tee, the landing area poses a conundrum. It appears that the better you hit it, the more uneven will be your stance for the approach shot. The best strategy is to find the flattest part of the fairway, about 150 yards from the green. However, there’s no truly flat part of the fairway, and those 150 yards play like 165 yards, uphill to a tiered green with a false front and an intimidating front bunker. It's a true test of concentration and execution to ignore the sharp drop-off on the left side and try to hit a draw off a fade lie. But a par will feel like a birdie. Make no bones about it, from the back tees, Raven’s Claw is a serious test. The rating is only 70.1 from the Blues and 71.0 from the Blacks, but the Slope is more telling—128 from Blues, 130 from Blacks. Scorecard. Rates. But the excellent condition of the course and the friendly staff will keep you coming back for more. For the amount of play the course gets (about 35,000 rounds/year), the greens stay remarkable smooth and birdie-able. However, subtle slopes here and there will perplex you more than once. The par-threes have a great mix of length, though the last one, the 17th, you should just play as a short par four. At 210 yards from the whites, the hole is intimidating even with an oversize green and a bailout front left of the green. Like other holes on the course, there’s an opportunity there to use the slope in front of the green to run the ball onto the receptive center of the green. The course offers a lot of value for the price. Unless you’re playing on a weekend morning, you’ll usually play for under $60 with cart. It’s more affordable than the normal math would allow. Many times green fees are calculated at $10 per million dollars spent to build the golf course. That means the Raven’s Claw fee should be $70 - $80 even during the week. That means you can afford to step inside at the 19th hole to unwind, or eat on the deck with a view of the 18th hole. The Grill at Raven’s Claw offers a tasty menu of burgers, sandwiches and sides and a selection of fine brews served ice cold. And the course is easy in and easy out, only about 20 minutes up Route 422 from King of Prussia.